Big Brother: [voice-over] This is our land. A land of peace and of plenty. A land of harmony and hope. This is our land. Oceania. These are our people. The workers, the strivers, the builders. These are our people. The builders of our world, struggling, fighting, bleeding, dying. On the streets of our cities and on the far-flung battlefields. Fighting against the mutilation of our hopes and dreams. Who are they? Q: Is Julia a member of the Thought Police? Q: What is the significance of NewSpeak? Q: What is a Proletariat? Merely a few days after finishing my read of George Orwell's fantastic 1948 novel "Nineteen Eighty-Four", I was immediately keen on looking to rent the modern film version, "1984" - filmed, appropriately enough, not only during the actual YEAR of 1984, but also during the exact same short span of months that the story took place in. This, to me, is a prime example of perfect, and unbelievably well-timed, brilliance. A picture based on such complex, prophetic, and well-known material could have turned out to be a complete disaster (which it certainly had potential for, judging from the horrendous-looking DVD cover); thankfully, however, I was not disappointed. 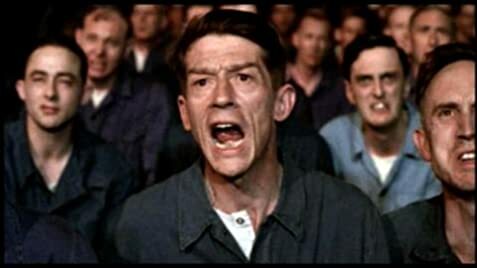 "1984" is probably one of the most, if not THE most, masterful transitions from book to movie I have ever seen. Easily, its most impressive aspect was its phenomenal accuracy, attention to detail, etc. In other words, this film was FAITHFUL, in every sense of the word, to its source material. One can't give such a statement about films these days. 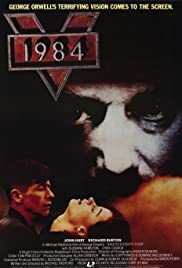 Amazing casting, terrific musical score, and mind-blowing sets, cinematography, and direction, "1984" is surely a unique treasure, and one that still retains the same timeless messages even decades since its release. 82 of 111 people found this review helpful. Was this review helpful to you?